Did You Know? This was the last R-rated film to top the yearly box office until American Sniper, 16 years later. Quotables: CAPTAIN MILLER: “The Statue of Liberty is kaput!” – That’s disconcerting. 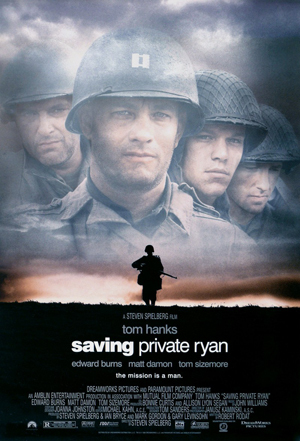 Saving Private Ryan is one of Spielberg’s greatest films. My favourite scene is seemingly minuscule, but I find it beautifully shot: it’s the scene where Corporal Upham (Jeremy Davies) is explaining the Édith Piaf song that’s playing over the gramophone. Then everyone begins telling stories of their sexual “conquests”. They’re all killing time, waiting for a German onslaught, bonding over small-talk, knowing that they could all be dead in a few minutes. They’ve been through hell, killed people, and watched their friends and brothers die, and they need a moment of peace. It’s the heart and soul of the film.